The late Middle Ages witnessed a flow of new knowledge into Europe, conveyed in part through the hands of Arab scholars in Moorish Spain. During this period, institutions of higher learning, studium generale, emerged as outgrowths of advanced courses that were offered in municipal cathedral church schools. In a fundamental sense, the first great universities of medieval Europe owed their existence to the growing numbers of foreign students who flocked to these cathedral schools for instruction. A local school was just that, but when a school’s reputation grew to the point where it could attract students from great distances, it could now be deemed a “university.” By the 1100s, such institutions had already emerged at Bologna, Paris, Salerno, and Montpelier. Oxford and Cambridge would follow. 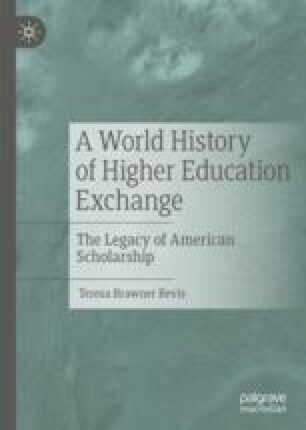 These early universities were instrumental in laying the curricular foundations for the European Renaissance and by extension became models for America’s first systems of higher learning.